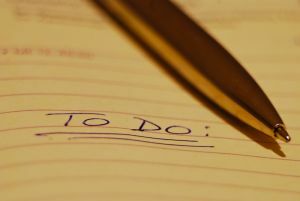 You know those daily goals that have been on your to-do list for the past couple of years? Every day you want to exercise, read something inspirational, learn a new vocabulary word, do a good deed, tidy up the house, etc… Wouldn't it be nice to conquer these goals and make room on your to-do list for new goals? The trick is taking these daily goals and transforming them into daily habits. Whatever habit you want to form, do it every day and track your consistency for at least one month. Tracking can be as simple as putting a check mark on the calendar for every successful day. After a month of doing something every day you’ve worked out all the kinks like when to do the activity and how to motivate yourself. When we have a routine, there is a sequence of events. After I shower, I get dressed. After I eat breakfast, I brush my teeth. Before I do anything else, I watch Seinfeld. Instead of setting an exact time for your goal you might try piggy backing it onto some other habit. This other habit becomes the trigger that reminds you of your goal and helps incorporate it into your routine. For example, if your goal is to read something inspirational every day, you could do it while you eat breakfast or before you go to bed. Sometimes a trigger isn’t enough and your goal is still frequently forgotten (sometimes intentionally). Write the habit down. Tell your spouse of friend about your goal so they can remind you. Associate yourself with people who already have the habit you want. If you want to do something before you go to bed, put a big – and preferably clean – rock on your pillow. This forces you to consciously move the rock and remember your goal. Then there’s no fooling yourself into thinking you “forgot”. Avoid the temptation to do a complete overhaul of your daily life. Work on one or two habits at a time. If you’re really feeling motivated and think you can handle it, you can try three. If you’re trying to form several habits at once, it dilutes your concentration to the point where all you habits may be abandoned.